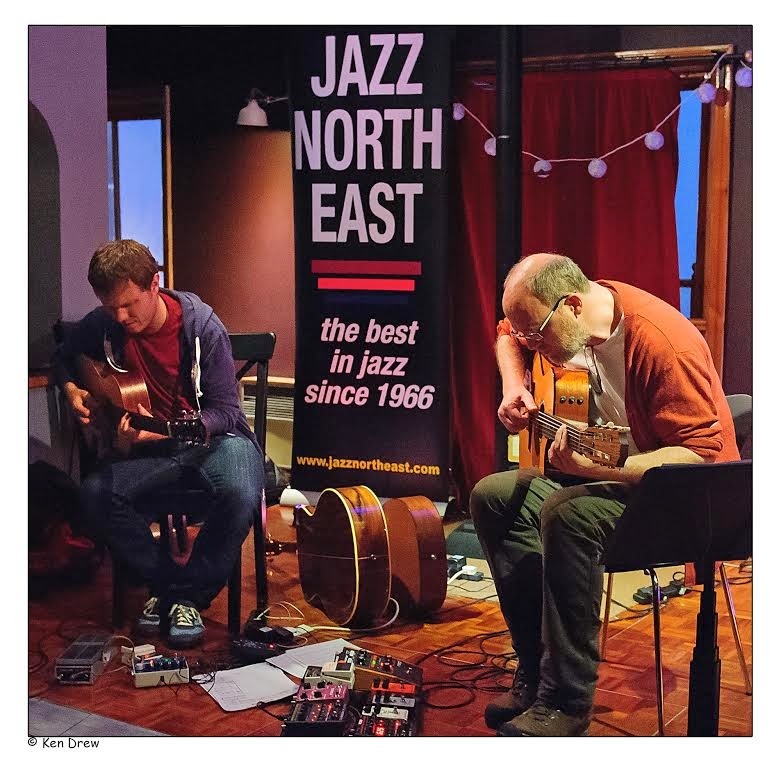 The latest in Jazz North East’s series of Schmazz gigs at the Jazz Café featured British guitarists Mike Walker and Stuart McCallum. All seats in the upstairs room were taken (two of the north east’s finest six-stringers bagged prime seats) and the stage resembled the guitar section of your local musical instrument store. The Greater Manchester-based duo settled down to play the first of two mainly acoustic sets in a setting Walker later described as having ‘a good vibe’. The material consisted of original compositions (a Schmazz prerequisite) and one or two standards. The opening number had an Americana feel to it, so it came as no surprise to learn it was Bill Frisell’s Where Do We Go? 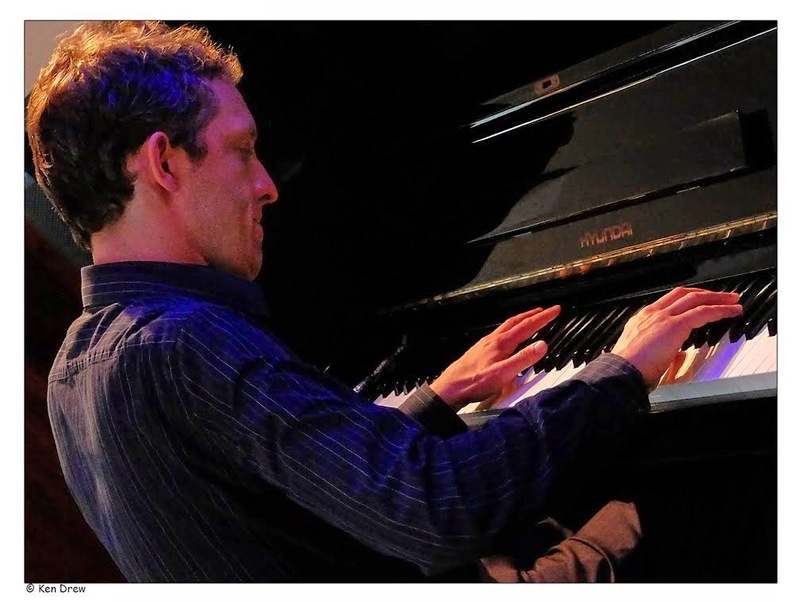 Walker, a man with an impressive cv – the big bands of Mike Gibbs and Kenny Wheeler, stints with Julian Arguelles and Nikki Iles, to his latest Anglo American project, the Impossible Gentlemen – shuffled a set list at will, suggesting to McCallum they do ‘Orpheus’. A change of guitar, some retuning, a bit of banter and into Luiz Bonfá’s Black Orpheus. This and the following number – All the Things You Are – exemplified Stuart McCallum’s penchant for reharmonizing tunes. Dark tones, dense improvisations, Walker picking up on McCallum’s initial foray, further solo invention, the seamless dovetailing of ideas. A Walker composition – Wallenda’s Last Stand – inspired by the life story of a high wire walker’s final, fatal, do or die journey and McCallum’s The French Song illustrated their talents as tunesmiths. The second set heard McCallum’s Beholden and Walker’s Clock Maker. Walker introduced the latter number with a hilarious, true tale of his friend saxophonist Iain Dixon’s father’s clock making obsession. Imagine a house full of clocks – He made one every four minutes, said Walker – all primed to chime on the hour. It was Walker’s mission in life when visiting Dixon Snr to leave before the cacophonous clock chorus struck up! A distinct folk strand ran through the second set, notably McCallum’s tune inspired by a visit to the Shetlands and his authentic folk ballad Seasons. The one time student of Walker has gone on to work in a variety of contexts including a plum job with John Surman, tenure with the hip Cinematic Orchestra and work with Tim Garland’s Northern Underground Orchestra (including an appearance at the Durham Miners’ Gala a few years ago). This Schmazz gig was one for students of the guitar rather than one for the jazz guitar purist. Earlier, pianist Paul Taylor played a solo set in the downstairs bar. The Tyneside-based Taylor developed ideas from an impressionist palette, quietly applying complementary hues to an uncluttered canvas. The audience listened intently, some seemingly holding a breath, such was the silence during a half hour improvisation. Next month’s Schmazz concert at the Jazz Café departs from the usual last Tuesday in the month date. The double bill of Troyka and Pulcinella can be heard on Tuesday 15 July. Great gig, very inspiring gig Mike! Thoroughly enjoyable gig left the jazz cafe buzzing. Great tunes, great repartee, great music, great night.